There is a wonderful, well used family play area in Cliffe Road Strood that needs some shade and shelter and what better and sustainable way than planting trees and bushes that additionally add character, colour and interest. Working with the community Strood Rotary obtained 100 tree whips from the Woodlands Trust, building on the global Rotary tree planting challenge of 17/18, and with volunteers from the community, the Mayor of Medway and professionals from the parks and amenities department, the trees were planted with stakes and protective covers within a couple of hours. Phase two of the project will be a hedgerow to stop run away balls from the football area. Projects like this in the heart of the community really do make a difference and other than some admin, it cost us little more than a couple of hours on a Sunday morning. Environmentally friendly, sustainable, community inclusive and rewarding. 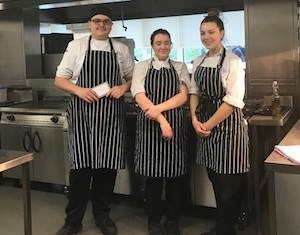 Ella, of Darrick School Orpington and the prize winner in the Rotary Young Chef Competion, subsequently enjoyed a VIP visit to the prestigious Chapter One Restaurant in Locksbottom. 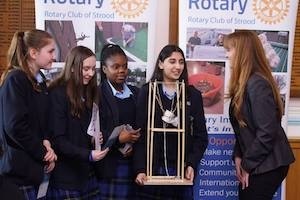 In March 2019, Strood Rotary with support of Medway and Maidstone clubs, organised and ran it’s third Technology Tournament. 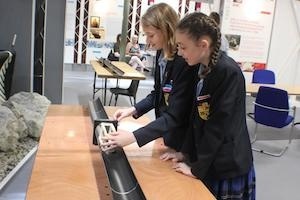 5 Schools, 15 teams, 60 students (plus a teacher team) spent the day constructing innovative technology driven solutions to a practical problem surrounded by military history in the inspirational surroundings of the Gillingham Royal Engineers Museum, the perfect venue. Teams covered Foundation, Intermediate and Senior levels and the results it has to be said, demonstrated various levels of success. The solutions had to negotiate a test track to complete the challenge which was a non-trivial task and even the teacher team only managed it to 80%. The schools and the students had a great day and the Rochester Bridge Trust who have supported the competition at RIBI level too, were there to present prizes. Press and even TV coverage on the 6:00pm news made the day for everyone. The winners at Senior and Foundation level were from the Rochester Grammar for Girls, whilst the Intermediate was won by Leigh UTC from Dartford. Altogether a wonderful day for schools and a great day for Rotary. Rotarians from the Rotary Club of Eastbourne Sovereign with their partners and friends were joined by Rotary District Governor Brenda Parsons, and members of the Rotary Clubs of Sovereign Harbour, Eastbourne AM and Newhaven for a Charity Lunch hosted by Neal Kirby, owner of the Langham Hotel. The guests enjoyed a three course meal with entertainment from Duality. As a result of ticket sales donated to Rotary, donations and the raffle over £2500 was raised towards Eastbourne Sovereigns Charity fund. 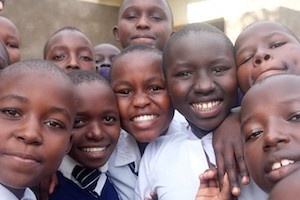 This year donations being made include those to St Wilfreds Hospice, Friends of Eastbourne Hospital, The JPK Project, The Eastbourne Lifeboat and Operation Smile which provides funds for operations to correct Cleft Palates in developing countries. 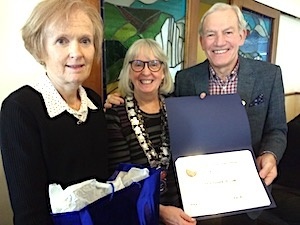 At the end of lunch DG Brenda made a presentation of a Paul Harris Fellow to Neal Kirby in recognition of his support of Rotary in Eastbourne and his many years of fundraising for local and National Charities. After a compelling final held at New Line Learning, Boughton Lane Maidstone, Claverham Community College Teams Managed to win both the Intermediate and Senior Competitions. With Topics ranging from "Should Teachers Carry Guns", to 11+, and "Chivalry is it Dead or Simply Misunderstood" to "Auditory Processing Disorder", and a highly entertaining "The Art of Public Speaking", young people showed an amazing range of skills and approaches to their topics. Teams from Towers School Ashford, Walderslade School for Girls, Folkestone School For Girls, Claverham Community College Battle showed immense skill and regard for their subjects. We Wish the Claverham Teams a great experience in the Regional Finals to be held at The Great Marlow School in Buckinghamshire on 7 April 2019. The members of Rotary in West Wickham were pleased to welcome Tricia White, a volunteer at Demelza, to their meeting on Tuesday 4th December. Tricia told the members that Demelza was celebrating its 20th anniversary this year after opening the doors of the first hospice in Sittingbourne. Within just a few years hospitals such as Guy’s, St Thomas’s and Great Ormond Street were stressing the need for the caring service that Demelza offers both children and their families, which led to the opening of a second hospice in Eltham. Tricia told of the close association between Demelza and West Wickham as a town, with the opening of the Demelza shop in March 1998 and how that relationship has helped develop awareness by the people of West Wickham of the need as well as providing funds. The association with Rotary in West Wickham has also been long standing and Tricia gratefully acknowledged both the funds donated at the time of the annual Charity Allocations by the club, and those raised by the “bucket collection” at the end of the Annual Fireworks Display. 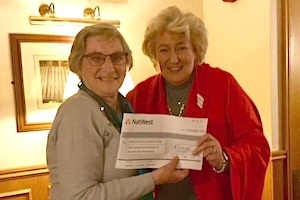 Rotary President Christine Atkinson continued the tradition of donating the proceeds from the Fireworks collection by presenting Tricia with a cheque for £576.63, raised through the generosity of the public attending the display. This was the 4th year the Rotary Club of Minster On Sea has held a Sanata Saunta; a gentle festive themed stroll along the length of Sheerness High Street led by the St John Ambulance band. The Saunta on Saturday 1st December 2018 eventually turned into a giant Santa Conga that ended with Christmas songs around the clock tower. The event was also part of the Sheerness Lights switch on. 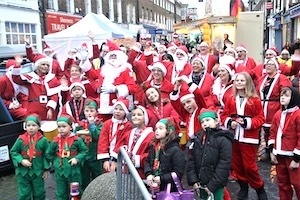 This year numbers were down due to the poor weather, but we still had approx 70 Santa and Elves. It looks like we raised around £1000 from sponsorships and bucket collections. Our thanks to DG Brenda Parsons and Rotary Club of Medway who supported us on the day. 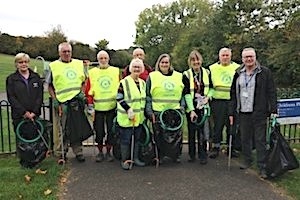 Ten Rotarians from the Rotary Club of Canterbury Sunrise hit an attractive riverside walk alongside the River Stour armed with litter pickers and between them collected ten bags of assorted litter. Cans, bottles, sweet wrappers, a pair of trainers and a sweatshirt were bagged up and collected by the Canterbury City Council’s cleaning contractors. The event was organised by Chris Redman, one of the Members and President Roger Neaves led the team searching out the windblown litter in shrubberies and other litter traps. Ten hours of Rotary service has enhanced the area for residents and the many visitors to Canterbury. 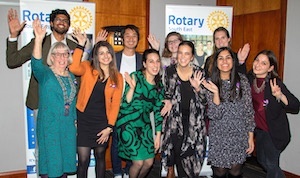 Earlier in 2018 the two Rotary Clubs of West Wickham and Addiscombe and Shirley had conversations to see what they could do to help the essential work to prevent dementia which is so much in today’s news. They decided to organise a Tea Party at Addington Palace Golf Course which was attended by over 100 Rotarians and non-Rotarians to raise funds for Alzheimers Research UK and on 20th November were delighted to welcome Georgina Welch and Katherine Espiritu, from the charity, to a joint meeting of the two clubs. Georgina gave a thought provoking presentation which put into layman’s terms what dementia was, the effect on those with the disease and their families and how it was now the largest cause of death of men and women in the U.K. In monetary terms dementia costs the U.K. economy £26 billion p.a., and leads to the take up of 1 in 4 hospital beds. Alzheimers Research UK is the leading dementia and Alzheimer charity, spending £21million p.a. on research and working in collaboration with other dementia charities. Their aim is to “Make Breakthroughs Possible” and find a life changing treatment by 2025. 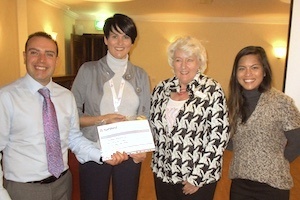 However, to do their work they have to rely heavily on non- state funding such as voluntary donations and giving, and the Clubs’ Presidents, Christine Atkinson from West Wickham and Oz Ozgenturk from Addiscombe and Shirley were able to present the charity with a cheque for £2,224 representing the funds raised at the Tea Party. The aim was to increase the fun element, raise our clubs profile and build up a following for the quiz nights and other events that didn't rely on Rotarians .That has been more than achieved with tables booked for the next quiz at the end of each one. In addition, we have hugely increased our Facebook following. New quizzers and Facebook followers have become potential members and supporters of our club, and we receive regular donations from them for our well stocked "raffle bank". Our quiz on 2nd Nov was attended by 81 people on 11 tables, and despite being 1 team down raised £655 for our Rotary charities. 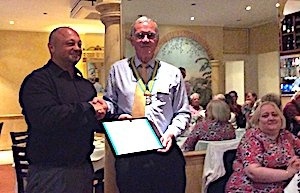 Conratulations to the Rotary Club of Minster On Sea; a club that are going from strength to strength. President Andy Brown and the members of the Rotary Club of Minster On Sea introduce six new members to Rotary. They were all inducted on the same night, which must surely be some kind of record. The club's recruitment drive goes on, and they are pleased to report that there are more potential members waiting to join. Rotary Global Scholars from the USA and Japan have arrived in Rotary South East. They are being hosted by the Rotary Clubs of Bexley, Canterbury Sunrise, Dartford, Darent Valley, Langley Park, North Downs, Orpington Crofton and Sidcup. 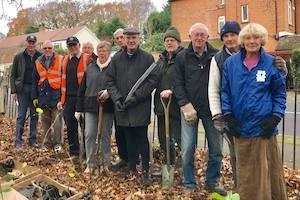 Tenterden Rotarians were joined by District Governor Brenda Parsons and Assistant Governor Bryan Vizzard as they planted two trees on Monday 5th November 2018. 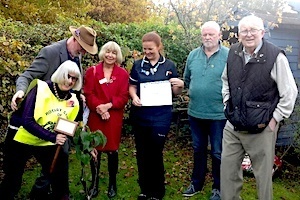 The purple lilac trees were planted in the garden reserved for Dementia patients and staff at West View Integrated Care Centre in Tenterden. We were joined by nursing staff, and by Jo Starr, Activities and Events Manager at West View, who was instrumental in setting up the event, and by John Goulden who is one of the leaders of Tenterden Dementia Friendly. Tenterden Rotary Club was 70 years old last year and in turn we are proud to honour 70 years of the NHS. The first time you enter Joe’s café in Birchington it takes rather a long time to get through the door! There are so many local notices and leaflets at the entrance, all begging your attention, you just have to pause and have a read! Once inside, the welcome is warm and the produce is enticing. On the counter an assortment of local community collection boxes is gathered. Scattered around the café are musical instruments and a baby grand piano, proudly awaiting their next party. A few months ago, the Rotary Club of The Isle of Thanet Sunrise took the step to change their usual Friday breakfast meeting and trial an occasional meeting at Joe’s instead. This enabled the club to keep in touch with members, who, for one reason or another were no longer able to attend regular meetings. It also gave the opportunty to meet potential new members in a relaxed atmosphere. Joe was quick to support these occasional ‘meet-ups’ and they have been successful. The café had no hesitation in providing space for a large jar to help the club raise funds for MND (motor neurones disease) by collecting used stamps. If only there were more places like this around. 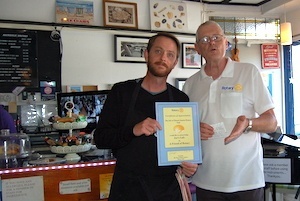 The extent to which this café has helped Rotary and other local community groups, prompted the club to find a way of giving this wonderful asset in the village some recognition. They decided to make ‘Joe’s café’ a ‘Friend of Rotary’ and think this may be a ‘first’! World Polio Day was established by Rotary International over a decade ago to commemorate the birth of Jonas Salk, who led the first team to develop a vaccine against Polyiomyelitis. On this day we remind the world that for Rotary, it's the No 1 programme priority for Rotarians across the globe is the fight to eradicate polio from this world. 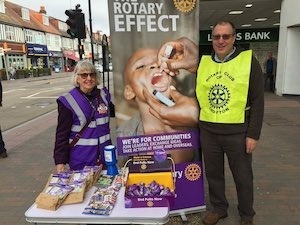 Rotart clubs across the district have been undertaking events in their local area and raising awareness of Rotary's 30-year battle to eradicate polio. District Governor Brenda Parsons and 45 others from across the Rotary South East UK district walked over the O2 Dome in London on 23rd October as an End Polio Now fundraising event. Clubs walking the O2 Dome with Brenda include: Tonbridge, West Wickham, Langley Park, Beckenham, Crayford, Isle of Thanet Sunrise, Herne Bay, Canterbury, Orpington Crofton, Bromley, Canterbury Sunrise, Ramsgate, Sovereign Harbour, Broadstairs, Senlac, Rye & Winchelsea, Bexhill on Sea, Canterbury Forest of Blean, Dover and Maidstone Riverside. 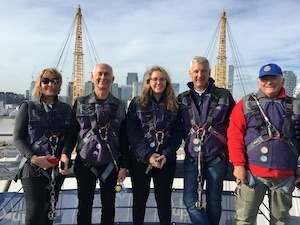 As part of our efforts to raise awareness and donations for the Rotary campaign to End Polio Now and forever 48 Rotarians from clubs all over Kent & East Sussex converged on the Greenwich Peninsula to climb the famous O2 Dome. This was to mark World Polio Day 2018 and to raise funds towards our End Polio Now campaign. They were then joined by family, friends and well-wishers at a celebratory lunch. Led by District Governor Brenda Parsons, 3 groups of Rotarians took part in the climb. A pull up banner promoting our Purple 4 Polio campaign displaying our End Polio Now ambassador Ade Adepitan also made the trip! In spite of the steepness of the climb on occasions, everyone thoroughly enjoyed themselves and it gave us a chance to promote Rotary and our End Polio Now campaign to the many other members of the public who were visiting the site at the time. Whilst we await final confirmation of the total sponsorship funds raised from those who did the climb, early indications are that several thousand pounds have been raised which, with the pledge from the Bill & Melinda gates Foundation will be tripled and donated towards the End Polio Now fund. 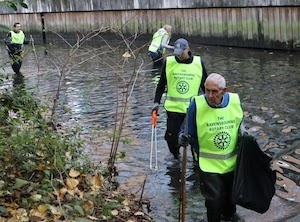 17 intrepid Rotarians – Including District Governor Brenda Parsons and friends of Rotary completed a clean of the River Ravensbourne in South East London on Saturday 20th October 2018. This was facilitated by Natures Gym, an initiative by Nature Conservation Officers from the London Borough of Lewisham, and Glendale ( a local contractor). It was a very worthwhile event as the group collected 8 black sacks of rubbish including a mobile phone, 8 golf balls, 2 footballs and a tennis racket and ball, various bicycle bits, a cycle helmet, a tea pot,various items of clothing, DVD’s, a hat, one walking stick a pair of crutches, an 8 foot scaffolding pole, two traffic cones, mountains of plastic, 20- 30 cans and bottles and two obligatory supermarket trolleys! It was successful on several levels. Rotarians were seen in the community by the general public in the river on a Saturday morning doing a hands-on job. We were asked several times about who we were and what we were doing, and this led on to explaining more about our Rotary club so it was also a membership /recruitment opportunity. 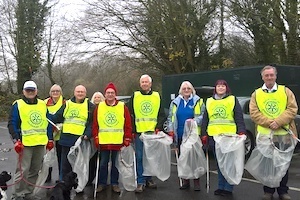 Members of the Rotary Club of Chatham had a successful litter pick on Sunday 14th October 2018. Local Councillors were in attendance, and equipment donated by ASDA at Chatham. The work team visited a recreation ground on Sunday morning and everyne filled a refuse sack of rubbish from around the area. Thankfully, the councillors also arranged for the bags to be picked up the following morning for disposal. 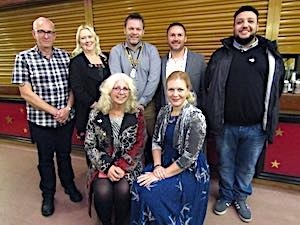 A launch event for Rotary Radio UK was held at The Criterion Theatre in Blue Town on Saturday 13th October 2018. This was attended by Rotarians, friends, sponsors and people who had helped build and furnish the studios in the theatre. Sittingbourne Invicta club members Steve Wood and John Robinson had the idea of radio broadcasting for Rotary last year. Once buy-in from Rotary South East was obtained, Steve & John formed a team of people including some from Gravesend, Medway and Minster-on-Sea clubs. Rotary funding from RIBI and district was forthcoming, and this enabled the team to locate premises for a studio and equip it. 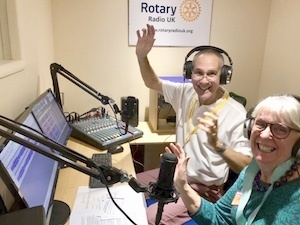 So after a few weeks of trialling recorded taster shows, Rotary Radio UK finally went live at 12noon on 13th October 2018. District Governor Brenda Parsons attended the opening event and was pleased to say a few words into the microphone. 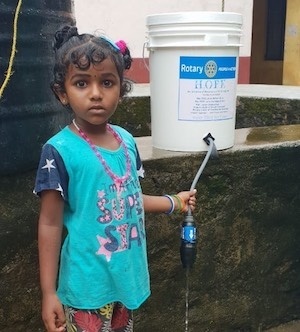 Rotary South East has teamed up with District 3211 in Kerala to gift water filters to schools in the region. Project Hope is a joint initiative between clubs in the UK and Kerala to provide water filtration kits to schools. PDG John & Liz Wilton, PDG John & Sue Dunkley, Rotarian John Cheesman and the Rotary Clubs of South Foreland and Eastbourne Sovereign have sent water filter kits for families. Other Rotary South East clubs have donated Shelterbox kits. According to Rotary in Great Britain & Ireland one thousand Shelterbox kits have already been distributed in different parts of Kerala and more are on the way. Each shelter kit provides tent, utensils and cloths for a family of four. Rotary in Great Britain and Ireland, along with Rotary Jaipur Limb UK, is also supporting six limb camps in Kerala. 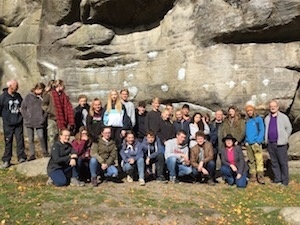 The district’s Autumn Rotary Youth Leadership Awards residential weekend happened on 5th-7th October at the Bowles Outdoor Activity Centre near Tundbridge Wells. Twenty-Four 14-17 year olds joined the weekend sponsored by eleven clubs from the district - the most clubs we have ever had sponsor attendees!! In fact the weekend was oversubscribed and we had to put attendees on our next course in the Spring 2019. A RYLA activity course is all about getting teenagers to discover and realise their potential as good leaders, communicators and team players. A group (max 24) of teenagers from all over the district are taken through a series of exercises to help them develop these skills with the help of qualified activity leaders from the Bowles Activity Centre. “Pushing The Envelope” is a phrase used very early on describing how participants are helped to move from their comfort zone in to one where their resilience and coping ability is tested so they gain better control in challenging situations resulting in growing confidence and ability to work as a team player and show leadership skills. Everyone without exception always says that they have ached more than they ever thought possible. If your club wants to sponsor a teenager or know more about RYLA, then please visit the RYLA webage. The next date is 26 - 28 April 2019. We look forward to seeing attendees from your club. BBC Children in Need will benefit from the efforts of 35 swimmers who took part at the West Wickham Leisure Centre on Sunday 30th September in an attempt to complete a marathon swim within 3 hours. As with last year, the result was tantalizingly close and the swimmers achieved a creditable 37 kilometers, (about 87% of a marathon) and their efforts have raised over £2,000 for the charity. The event was organized by Rotary Club of Beckenham with the help and support of other clubs and local community organizations. The Mayor of Bromley, Councillor Kim Botting, accompanied by her husband, graciously attended and awarded medals to the swimmers and then drew the winning raffle ticket for the giant Pudsey bear. We are very grateful to the West Wickham Leisure Centre and all our sponsors, whose generous support made this event possible. Members of the Rotary Club of Orpington and their partners have just returned from a wonderful weekend in Wuppertal, Germany. This was an international meeting of three clubs, and proved to be a great weekend of fun, food and fellowship with friends from Maubeuge, France and hosts Wuppertal, Germany. During the weeknd visit Orpington members travelled on the famous Schwebebahn railway, visited the Junior University Wuppertal and had lunch at Wasserburg Dussel village. The Saturday evening was a tripartite dinner with President Nigel giving an excellent address on behalf of the Orpington club. Congratulations go to Scott Reeve, member of the Rotary Club of Faversham, who was awarded a Paul Harris Fellowship at the District Council meeting on Thursday 17th May 2018. The award was given to Scott by DG Carol Vizzard for his work with RYLA over many years. 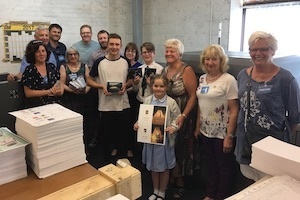 Yesterday afternoon, 14th May 2018, the winners of the Rotary Club of Herne Bay's Photographic Competition 2018 visited the Noel Tatt Group to see their entries turned in to cards. Lucy Barton was winner of the Senior Category, and True Rainbow was winner in the Junior Category. We were also joined by Carol Vizzard, District Governor and Stewart Neame, Youth and Community Chairman in Herne Bay. As part of a medical team initiative in West Pokot, Kenya, our Yellowmen nurses produced a presentation on menstruation designed to educate girls in what was happening to their own bodies. they also produced a tool to get local teachers and medics to help change the lack of support for girls suffering from painful periods and lack of basic knowledge. Sufficient sanitary towels were also taken to supply each girl attending one of the presentations with a month's supply. Once this became apparent, the Yellowmen ladies went into action and the Knickers Project was born. So far sufficient money has been raised to purchase 1500 pairs of pants to be given out to girls when they receive their free sanitary towels during the September 2018 Yellowmen visit. 1500 pairs of knickers may not be sufficient but it is a start and the knickers project is a bit 'elastic' in that it will grow as more money is collected. Four members, and their partners, of the Rotary Club of Ashford were recently privileged to be invited to attend the Anzac Centenary Commemorations at the Australian National Memorial (ANM) in Villers-Bretonneux, northern France on 25th April 2018. The commemoration was also attended by HRH the Prince of Wales, the Prime Ministers of France and Australia and Rotary International President Ian Riseley. Ashford Club President, Steve Parkin, commented "the visit was a great success. We were humbled and honoured to know that we were some of the very few English people to be invited to the Australian Commemorations. The Club’s whole visit actually lasted three days and took in the French Rotary District 1520 conference, meetings and celebrations with their twin club of Amiens, the RI President, Ian Riseley and other French and Australian Rotarians. Congratulations to the RC Strood for putting on a Technology Tournament for local schools! On Friday 16th March 2018, Strood Rotary Club organised a Technology Tournament at The Royal Engineers Museum as part of British Science Week. Westlands School won the Advanced competition, Rochester Grammar School won the Intermediate competition and Northfleet School for Girls (year 7) won the Foundation level competition..
A special thanks must go to local Rotarians who also provided help on the day, and to local MP and honorary member of Rotary Club of Strood, Kelly Tolhurst, who presented the certificates on the day! An audience in Bromley was treated to inspirational performances by young musicians from the Bromley Youth Music Trust last Saturday 27th January 2018 at the Rotary Trotman Final, held in the Bromley Youth Music Trust’s performance space. The winner of the Trotman trophy, and £150 to further her musical studies from Rotary in Bromley, was Sophie Oliver who played the cello. Eight talented young musicians each played for 10 minutes demonstrating amazing skill and technique, as well as a laudable empathy with the pieces of music that they had chosen to play. 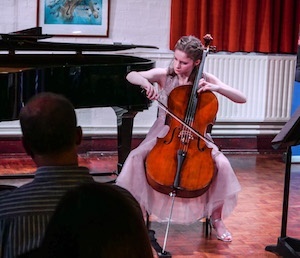 Cellists Anna Crawford and Sophie Oliver, french horn players Isabella Ward-Ackland and Leo Glenister, trombonist Emma Mitchell, violinist Lisa Archontides-Tsaldaraki, trumpet player Ed Sykes and pianist Arul Gupta, entertained and impressed the large audience with their playing. The Adjudicator, Murray McClachlan, was extremely impressed and gave very positive and encouraging feedback to the young and very gifted performers. The Adjudicator amused the audience by commenting on the use of music scores by the contestants. Some had the scores on music stands and others played by memory. A memorable evening celebrating the wealth of talent of the young people of Bromley. Sophie Oliver, Rotary Trotman Winner, and Joe Davies. the BYMT Classical Singer of the Year for 2017, will represent Bromley Borough at the Rotary South East District Young Musician Final on February 10th at the Invicta Grammar School, Maidstone. Rotary in the Borough of Bromley are proud to be partners with Bromley Youth Music Trust and to sponsor this event. 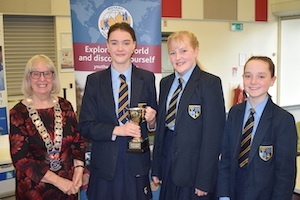 The Rotary Club of Darrent Valley held their annual competition at the Longfield Academy on 13 December 2018. Each contestant prepared a three Course meal for two persons in 2 hours. All the meals were produced to time and budget and were judged by Rotarians Josie Morgan, Ricky Pristernik and Stewart Grainger. The standards were high and it was a close run competition. The winner was James Bishop from New Ash Green and he was presented with the prize of a Bluewater Gift Card for £50. James will now go onto the District Competition to be held in Maidstone in January 2018. The Rotary Club of Darent Valley had the pleasure of hosting a Global Scholar, Makiko from Japan, and a Peace Scholar, Jessica from the USA. 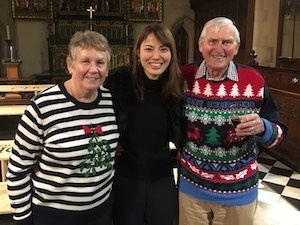 Sheila and Stewart Grainger enjoyed some early Christmas cheer with Makiko when she appeared in the university choir singing in both latin and English. Sheila and Stewart also enjoyed an early Christmas dinner with Jessica and Makiko and her partner in the Crusting Pipe, Covent Garden. 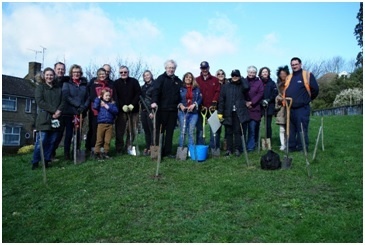 Members of Langley Park and Beckenham Clubs put on their wellies and joined forces to plant 120 trees in South Hill Park near Bromley on Wednesday 6th December 2017. Both clubs were determined to meet a worldwide Rotary goal, set by Rotary International President Ian Riseley, where every Rotary member plants at least one tree each and change the environment for the better by Earth Day on 22nd April 2018. A tree-mendous effort by these two clubs. At a meeting attended by 54 members and guests the Rotary Club of Tenterden celebrated 70 years of service to the community. The club was chartered in 1947 and a meeting was held on Tuesday 7th November 2017 in Tenterden town hall; at the same venue and time as that original meeting. President Chris Milne outlined some of the history of the club and said that since its inception it has raised about three quarters of a million pounds for charities in addition to organising events and sponsoring youth activities. One founder member of the club, Robert Cruttenden, a former Mayor of Tenterden is no longer alive but his portrait in the corner of the room seemed to be smiling in approval. 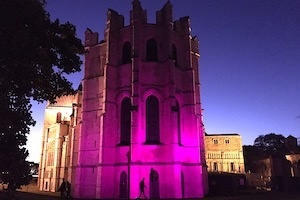 Canterbury Cathedral turned purple on Tuesday, 24 October, 2017 - WorldPolio Day. The Corona at the east end of the Cathedral joined many of the important buildings around the World when it glowed purple to mark World Polio Day. When children are immunized against poliomyelitis a little finger is dipped in purple ink. This colour has now been carried World-wide as a symbol of the battle to finally eradicate polio. Rotary in the South East asked The Chapter of Cathedral for their support and are delighted that such an iconic place has embraced this World-wide gesture. Though polio may seem distant in this country there are still around 100,000 people here being treated for post polio syndrome from the epidemics of the 1950s and 60s. “We are so very close,” said Rotary District Governor Carol Vizzard. “There are just two countries now where polio has been found and only 12 cases so far this year. This compares with over 300,000 thirty years ago. 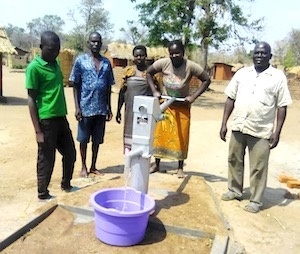 In August 2016, Tenterden Rotary Club set out to help a village in Malawi build a new water borehole for a community centre comprising a school and five surrounding dependent villages (circa 1,200 population). With the help of a District Grant and the pledge of funds from the club the estimated cost of around £2000 was covered. We also enlisted the help of Water Aid (a charity that provides advice, technical guidance and local knowledge) who confirmed that the project was viable. With the significant help of a local charity, Starfish Malawi, the project was initiated and in June 2017 the site for the borehole was chosen and the necessary equipment was purchased. The borehole was started in late September. It is quite amazing that they still do this by hand!!! - or should I say many hands!!!! Everyone celebrated the completion of the borehole on 2nd October 2017. The water was rather brown at first but cleared during the following few days. Clubs throughout Rotary South East have been out and about recently collecting money to support disaster relief aid in the wake of recent hurricanes across the Caribbean. On Saturday 23 September 2017, the Rotary Club of Faversham responded to assist people in distress around the world from recent natural disasters and conflict by raising money for Shelterbox. 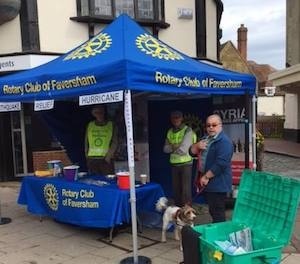 Club members took their stand and a Shelterbox to the market square, and raised over £230 thanks to the generosity of the people of Faversham. The Rotary Club of Faversham now intends to sponsor a complete Shelter Box, which can provide the much needed basics for a family to survive when sudden disaster strikes. 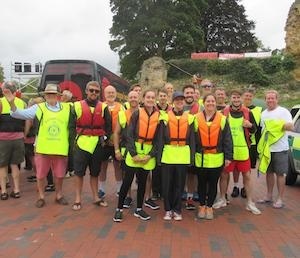 The Fifth Annual Dragon Boat Races organised by Tonbridge Town Team was held on the River Medway on Sunday 10th September 2017. This was also the third year that Tonbridge Rotary Club has taken part with their Go Rotary Team. The Tonbridge Go Rotary crew consisted of 16 rowers including two Past Presidents, the current President, a future President and many members of their families. President Robert Greenhalgh was also the boat drummer who kept the paddlers in unison by beating time on his drum! Fortunately all teams had a professional helmsperson in the stern to guide the boats. 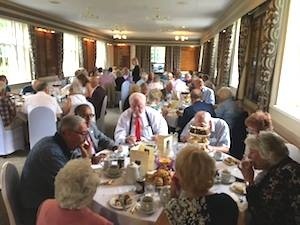 An End Polio Tea Party at Addington Palace GC on Sunday 20th August 2017 was attended by over 100 Rotarians from 12 local Rotary Clubs and from 2 Rotary Districts. Great food, great entertainment and close to £5k raised was raised (including Bill Gates effect). The event was well organised by 4 Clubs from the Borough of Bromley. Great collaboration. Attended by District Governor Carol, DGE Brenda and last year's DG Peter. Ravensbourne became the newest club in Rotary South East on Wednesday 19th July 2017. 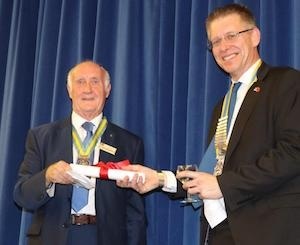 Dickon Bowden, first President of Rotary Club of Ravensbourne, received the club's Rotary Charter from Assistant Governor Mike Martineau. Messages of congratulations were received from RI President Ian Riseley, RIBI President Denis Spiller, DG Carol Vizzard and DGE Brenda Parsons. Strood Rotary Club organised a Technology Tournament on 7th July at the Royal Engineers Museum. Rotarians helped from Strood, Chatham, Rochester, Medway, Medwayp Sunlight, Maidstone Dawn Patrol, Maidstone Riverside and Sittingbourne Invicta clubs. Contestants were asked to build a pipeline vehicle and were scored regarding construction, planning and portfolio. Rotary District Govenor Carol Vizzard was present through-out the day and the event was also attended by the Deputy Major for Medway Gloria Opara. The next Technology Tournament has been arranged for Friday 16th March 2018. The Rotary Club of Herne Bay have, for several years, been running the Rotary Young Photographer Competition awarding prizes to the winners in each age category. A team of local experts has been used to judge the photographs, bringing their own skills to the competition. The entrants’ photographs have been displayed at Beach Creative in Herne Bay, and the exhibition has been open to the public for several days culminating in an award evening attended by the entrants and their parents. This year the winners in each category were generously offered the chance to have their photographs turned into cards, with amazing results. Herne Bay will be running the competition again next year with the added twist of allowing the entrants to mount their own photographs and organise their own display area. 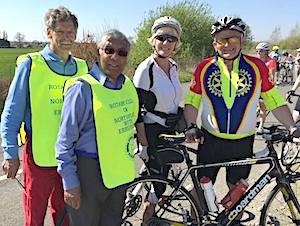 The idea came from the President of the Rotary Club of Bexhill on Sea, Geoff Longmire, who earlier this year suggested that a team from the Club should cycle from Douai in France to Gouda in the Netherlands; both towns having Rotary clubs who are also contact Clubs for Bexhill. So on 25th May 2017 ten riders from Bexhill and Chris Barnett tarvelled to Douai via Dover. where they met members of the Rotary Club of Douai for dinner. Day one of the ride followed the next day, and the riders soon left the cobbled streets of Douai and picked up the river tow path. After a night stopover in Oudenaarde, the riders set off once again and were in Ghent by lunchtime, and then cycled in 32oC heat on to Antwerp for another overnight stop. The riders woke on day 3 to torrential rain, but luckily this had cleared by the time they set off again. A few punctures later the team arrived in Breda and coincided with the final day of Breda’s international jazz festival. 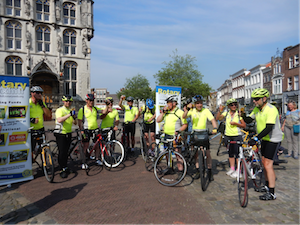 On the morning of 29th May 2017 the riders had just 50 more miles to go, and were joined for the last 10 miles by three Rotarians from Gouda. The end came with a sweep around the square in Gouda, and across the finish line between two Bexhill pop up displays. We were greeted by our partners, Gouda Rotarians and friends and a tray of thirteen glasses of cool beer! DG Peter West, PDG Martin Williams and President Chris Bunting of RC Sittingbourne Invicta were present for the handover of a bus at Bradfields Academy, Chatham on 24 May 2017. 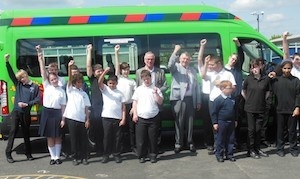 The bus was given in aid of the PDG Martin Williams charity Lord's Taverners. £16k was raised by Rotary South East, which is roughly half the total. The Lord's Taverners were represented by Tom Warner, the Regional Development Manager . Sunday 9th April 2017 - My first bike event of the year; Gravesend Rotary Club's annual event in aid of Elenor Hospice and other charities. Thirty glorious miles through North Kent countryside in stunning weather. A couple of challenging, cramp inducing hills; one just under two miles we were told. Joined by training buddy Jenny Olpin. My sixth ride with them so now have a set of six slate coasters. For Gravesend, their thirty first! Congratulations to RC of Gravesend for a safe and well organised event. Now rehydrating with a cool G&T! Companionship at Christmas recently celebrated 25 years of providing Christmas dinners to those on their own in Sittingbourne. Over Christmas Day and Boxing Day, 120 people enjoyed each others company over the festive season. There was lots of laughter, music, balloons and a special cake marking the 25 years. Everyone enjoyed the truly excellent cooking from the volunteers who gave up their own time over the Christmas period. Companionship at Christmas is a charity supported by the Rotary Club of Sittingbourne Invicta and club member Pamela Prescott helped hand out dinners and presented a cheque for £200 as the club's contribution to this years event. It is with regret that we announce the closure of the Rotary Club of Crowborough at the end of December 2016 with a loss of 14 club members. This club has been engaged in much active service in Crowborough since it was chartered 64 years ago, and will be a great loss to the town. 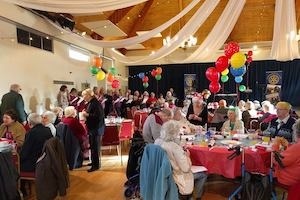 On Monday 5th December 2016 the Rotary Club of Faversham hosted over 120 senior citizens to a Christmas Fish and Chip lunch in the Alexander Centre. Music, Christmas Carols and plenty of cheer were heard on what was a memorable occasion. 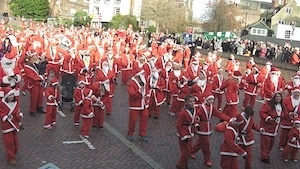 The Rotary Club of Medway held it’s annual SantaFunRun in Rochester High Street on November 19th 2016, attracting well over 800 red clad Santa’s. 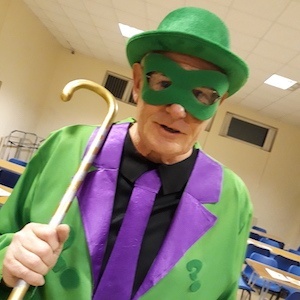 The spectacle was a stirring event that raised over £8,000 towards next years Rotary Children’s Hospice Family Holiday, that will be the 9th year the Club have hosted 6 families from Demelza and Ellenor Children’s Hospices. Ghosts and ghouls have raised £1,200 for charity in Pevensey. 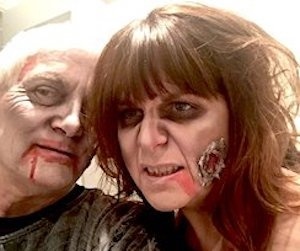 A Halloween night at The Smugglers Inn saw 76 members of the Rotary Club of Sovereign Harbour, along with their friends and family attend a dinner for the Children With Cancer Fund in Polegate. During the evening there was live entertainment, a raffle and a special cake to help notch up the funds. Plenty of weird looking Rotarians too! It was very much Ade's day at the Rotary South East conference on Saturday 29th October 2016. Born in Nigeria, Ade contracted polio aged two that affected both his legs, and his parents made decision to move to UK when he was three. He went to school in Plaistow, East London, and was recognised by his school-mates as a ‘tryer’; especially in sports. Ade was spotted by two physios with an ‘East End Project’ while being pushed on a sponsored supermarket trolley race, and he was persuaded to become involved in the programme. 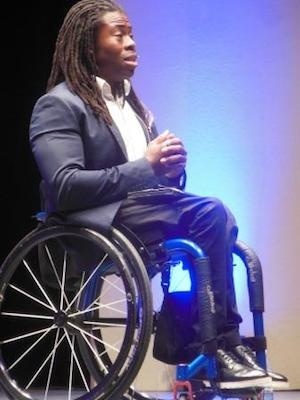 Thanks to that, Frank Bruno raised money to buy him a lightweight self-propelled wheelchair. Ade completed in a scratch paralympic basketball team in Cyprus that beat the favourites (the Germans), and has never looked back. He has now become a Rotary polio ambassador, and advocates for the the polio eradication endgame. He so richly deserved the standing ovation the hall gave him following his conference appearance. Ade also donated his appearance fee to the fight to eradicate polio. Monday 24th October was World Polio Day, and to mark the event a group of Rotarians from the Sittingbourne Invicta and Sittingbourne & Milton clubs met at Hempstead House Hotel to plant 5,000 purple crocus corms. Purple crocuses are the international symbol of the campaign to eliminate this dreadful disease from the world. Initiated by Rotary International and supported by other organisations, this campaign is at the point of total elimination of the disease. In 2016 to 30 October there have been only 30 cases of polio, compared to 74 in the same period of 2015, and 350,000 cases in 1985 when Rotary’s campaign began. Despite this success, $1bn per year will need to be spent on vaccinating children for the next few years until we have two years without a case and a polio-free world can be celebrated. The corms have been planted on the bank outside the hotel, and will provide a spectacular display in the early spring of 2017 and subsequent years. 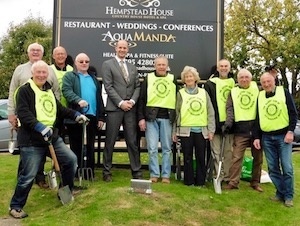 The picture shows the team from the two clubs with Mike Wood, Manager of Hempstead House Hotel. Thirty people from The Rotary Clubs of Sittingbourne Invicta and The Isle of Sheppey met at the Swale Indoor Bowls Club on Wednesday 19th October 2016. This has become an annual get together to renew friendships, but it is also a serious bowls challenge competition. The 24 players had training at the start of the evening, followed by bowl practice and then a buffet supper before the competition got underway. Four teams then spent over 2 hours bowling. With Sheppey winning previous years, it was good to see Invicta as overall winners on the night with all matches won. Total: Invicta 46, Sheppey 23. 22 Sittingbourne Invicta Rotarians and partners visited Royal British Legion Industries (RBLI) in Aylesford on Monday 25 July 2016. This was an alternative meeting to our normal evening meeting. Geoff Streetley, Director of Commercial Operations, gave a presentatation in the boardroom about RBLI; covering its aims, assests, products, services and funding. 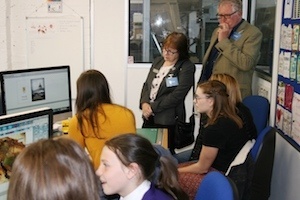 Club members were then split into two groups for a tour of the factory, which took us through the sign-making area where we were shown their state of the art printer. The tour then went into the Connect area where workers were making display models for shops. We were also shown the pallet making and pallet recycling facility. Finally, we all enjoyed a lunch back in the boardroom. Everyone said they enjoyed the visit, and thanked Geoff for making the visit possible. At the beginning of July, Bexhill Rotary Club heralded a new president, Geoff Longmire, and it was at his first full meeting in charge at Cooden Beach Golf Club on Tuesday 19th Julythat he was ‘invaded’ by a troupe of Maasai Warriors who performed authentic Maasai tribal dance. The Osiligi Maasai Warriors, to give them their full title, come from the village of Oleopolos and surrounding communities in southern Kenya and are currently on their fourth tour of England. The Warriors, resplendent in traditional costume, gave a stirring display of song and dance, which included the famous Maasai jumping – at one point President Geoff Longmire was hauled on to the dance floor by one of the Warriors and he gamely set about giving a reasonable impression of a Maasai Warrior even including one or two impressive jumps, much no doubt to his surprise and certainly to the surprise of the assembled Rotarians and their guests. Not only were the Rotarians and guests treated to tribal dancing but also to the history of the Maasai. The Maasai used to rely on their warriors fighting other tribes, quite often for the possession of cows (the Massai consider all cows in the world belong to them), but nowadays the warriors swear by the pen in one hand and a book in the other, instead of a spear and a shield. Respect was also strong in the Maasai, respect for others and respect in particular for ones elders, as well as respect for the land and other living things.